ANNA IS FOCUSED ON LISA BREEDING WITH TYLER FOR THE Vs' EVOLUTION, WHILE DIANA AND THE FIFTH COLUMN LOOK TO END ANNA'S CONTROL, ON THE SEASON FINALE OF ABC'S "V"
"Mother's Day" - Anna is focused on having Lisa breed with Tyler to ensure the evolution of the Visitors, while Erica and Diana enlist Lisa to stage a coup against Anna and remove her from power before humanity is destroyed. Erica and the Fifth Column join Lisa in the attempted coup, which has devastating results, on the shocking Season Two finale of "V," TUESDAY, MARCH 15 (9:00-10:01 p.m., ET) on ABC. Also in the episode, Marc Singer, who played freedom fighter Mike Donovan on the original "V" series, will guest star as Lars Tremont, a member of a top secret organization of high-ranking military and government leaders from around the globe who have long suspected that the Visitors are very much not here in peace. 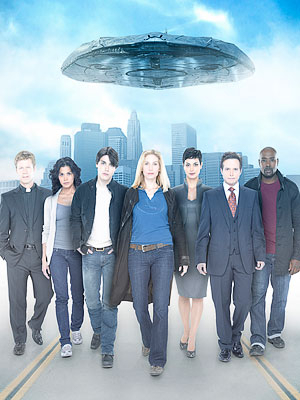 "V" stars Elizabeth Mitchell as Erica Evans, Morris Chestnut as Ryan Nichols, Joel Gretsch as Father Jack, Charles Mesure as Kyle Hobbes, Logan Huffman as Tyler Evans, Laura Vandervoort as Lisa, with Morena Baccarin as Anna and Scott Wolf as Chad Decker. Guest stars include Jane Badler as Diana, Marc Singer as Lars Tremont, Roark Critchlow as A.D. Paul Kendrick, Jay Karnes as Chris Bolling, Mark Hildreth as Joshua, Christopher Shyer as Marcus, Martin Cummins as Thomas. "Mother's Day" was written by Scott Rosenbaum & Gregg Hurwitz and directed by Bryan Spicer. Loved that Tyler and Ryan died, Diana's death was cool, too. Anna was really badass... "that's how you kill your mother"
Hmm, the twist with Erica and "Dutch" was pretty cool and unexpected. Could be a good storyline for S3. Yeah, I don't think a third season will happen. Glad that they got rid of Tyler and Ryan, I couldn't care less about Diana. The "Project Ares" was indeed interesting, but...not enough. If it comes back, I won't be watching. "There's something you better understand about me because it's important. And one day your life may depend on it...I am definitely a mad man with a box." Oh my gosh. That was V's best episode. It was amazing. First, HOW did I manage to miss Hobbes' and Erica's scene in bed? Second, three deaths. Ryan, Tyler, and Diana. The last two are really bloody deaths and pretty disgusting. Ryan's death was...awful, being killed by his daughter. Just a sad, bad way to die. Tyler...you know your mother will be mourning eternity for you. RIP, Diana. Sad to see you go. I honestly thought humanity had lost all hope until Erica got napped and they brought her to their headquarters. All is not lost! Jack's blissed, Ryan's dead, Hobbes and Sid have vanished, Chad is in a mess. Erica's on her own. PS: Hobbes needs to come back. Okay, this episode was amazing! Oh I hope ABC keeps this show going. I'm totally hooked now! "I honestly thought humanity had lost all hope until Erica got napped and they brought her to their headquarters. All is not lost!" They killed just the right characters, all the annoying ones. - Ryan... OMG!. All the season trying to rescue Amy only to be killed by her. Talking about Amy, if it there's a 3rd season, let's see how much long will Anna keep her. Because Amy is dangerous. - "Now, that's how you kill your Mother". How can you be so naïve, Lisa? - Erica talking to Jack. Can I adopt him? Can he be more cute? ^_^ I've loved that moment. Now, he's blissed. - We don`t know what happened to Chad. - Paul and Chris work for Project Ares. That was unexpected!!! Wow! I thought it was great series finale! I was sad to see Diana go, and not that I didn't want Tyler to meet his end, but I really felt bad for Lisa, which with season 3 pending, I will have to refer to as Lisa-A. And Ryan should have seen that this little girl isn't his any more, but alas what can you do when you love your kids. Sibling Rivalry! I definitely can see a few crazy sanarios. We have Amy who may emotionally effect Anna.I can see her becoming a bit confused or emotionally manipulated by Amy. Then we have Lisa-B that could decide that she has what it takes to rule all and become horrifically cut throat, which of course could also lead to an Amy and Lisa-B Godzilla War! --Lisa-A will hopefully will escape with the help of Joshua, or maybe even Marcus (not convinced of his over all motive yet), or perhaps Diana left instructions for a back-up plan! At any rate seeing that Hobbs has disappeared, and Jack is blissed, and the introduction of Project Aries seems to allow for an array of plots and a need to introduce new characters. -And if Tyler is dead and this plot with the human soul doesn't reach out in the realm of irreversible experiences, then we can be sure Erika has NOTHING to loss now!! Yet for all their evolution, they form no bonds. Of contemplating beauty, Of knowing something greater than themselves. Location: The Swan of Island's Past. I was watching the episode again and something keep my attention: Did Anna said "tell them where the FBI is holding Lisa?" Dis she actually said FBI? But ultimately it's a shame to see it go. I think they wasted a lot ot precious time on laying setups and ground work for a season three that they could have used for a better end game. But, I admit, if TPTB were granted a 3rd season... I would watch it even more now. Hey guys!!! I was wondering if anyone could tell me what's the song that played at the finale???? ..because he's her Romeo & she's his Juliet.....! I'm so psyched now. This can't be cancelled now. Not now that sh*t is finally getting REAL! Lisa is becoming one of my favourite characters where as I hated her in Season 1! Anna is such an amazing villain, i actually respect her. Tyler is dead -> YES! Ryan is dead -> YES! Diana is dead -> Not really bothered. Lisa1 vs Lisa2 = Cat fight! I can't wait! Jack has lost his faith! Where the hell are Sid and Hobbs? WHERE? Don't like the Guy in charge of the Project. I know, I'm falling for the writers trap, trying to convince all of us with this loose ending but I'm falling for it and I'm totally enjoying myself. I NEED SEASON 3! It goes to my complant, although the best episode to date, it's a little too little, too late. And yes... Lisa was completely smoking hot... both of them. Well, it went out with a bang at least. And never in my life have TPTB so efficiently killed off the characters that I wanted to see go. I found myself really wanting to see more of the bigger better Earth defense. I wish they'd introduced that much sooner. One of their better payoffs was that Erica's boss who has seemed like he was up to something the whole time. . .really was up to something. . .just not what I thought he was up to. Oh well, I enjoyed the show. Too bad it didn't get picked back up but I can kind of understand why it didn't. It missed that certain something that makes you excited to tune in each week.